Hundreds of thousands of Rohingya refugee children are cut off from education in the border camps of Bangladesh. The Rohingya ethnic minority from Myanmar is one of the largest stateless groups in the world. Since the 1940s, ongoing persecution, violent military campaigns and gross human rights abuses have caused the exile of over one million Rohingya people. Over the years, many have fled across the border to Bangladesh. Until mid 2017, according to government estimates, Bangladesh was already hosting around 500,000 displaced Rohingya. With the UN camps at capacity, makeshift camps emerged, but conditions were poor and children had no opportunity for education. Children on the Edge has been working in Kutupalong makeshift camp since 2011, providing low profile schools for 2,700 children. The long persecuted Rohingya have had relatively little attention from the international community, but in August 2017, co-ordinated military attacks in Myanmar turned the media spotlight onto their plight. This was the most brutal wave of violence against the Rohingya to date. Described by the UN as ‘a textbook example of ethnic cleansing’, the offensive forced an extra 750,000 Rohingya over the border into Bangladesh, directly into the areas where we work. 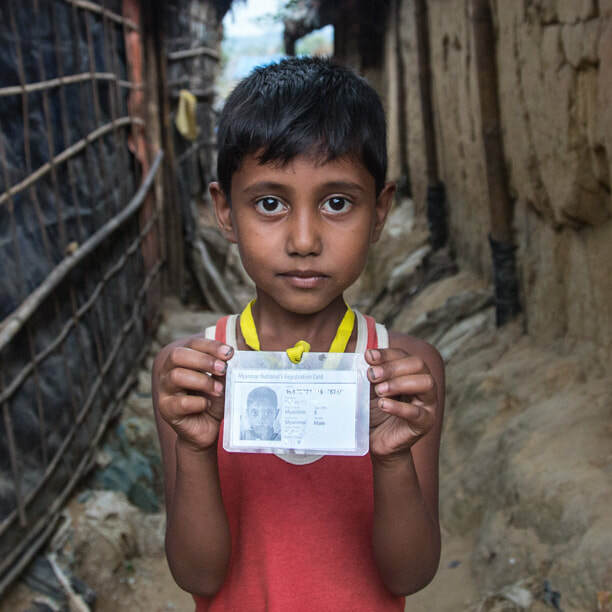 There is currently an estimated 902,000 Rohingya refugees in camps along the Bangladesh-Myanmar border and an additional 7,000 in the host communities. In full consultation with local refugee communities, Children on the Edge joined the international effort in providing humanitarian support for immediate needs in the wake of the crisis. This was the first phase of our response, the second two focussed on ensuring consistent support for children, long after the initial surge of international attention subsides. 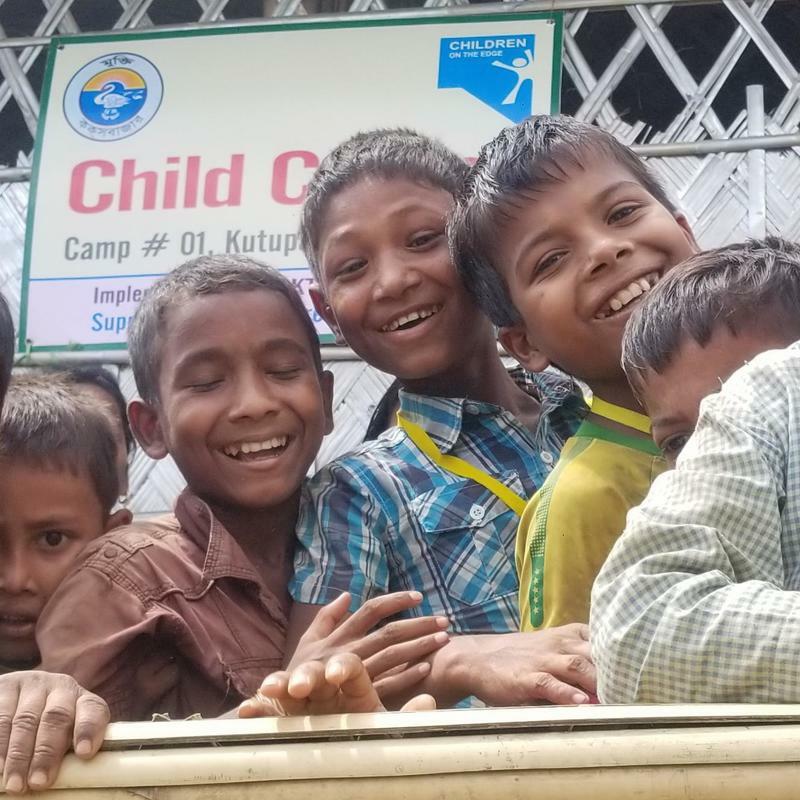 Children make up 50% of the Rohingya refugee community, and, despite the wealth of agencies investing in education for children in Kutupalong, only about 45% of refugee children currently have access to education in the camps. In addition to the daily stressors of displacement, children have suffered profound trauma and, with little access to safe, child friendly facilities, they face serious protection risks including abuse, child marriage, trafficking and child labour. Without adequate support, children here face the prospect of growing up without an education and without the means to process the horrific events they have lived through. 150 classrooms in the Kutupalong camp provide education in a child friendly space, for 7,500 children. After a broad survey of the new refugee arrival areas, covering territory with more than 30,000 new households, zones with the lowest prevalence of health and education services available were identified and contact with local leadership was established. ​As a result, together with our partner Mukti, Children on the Edge is focussing efforts into these blocks in the refugee camps. ​Our original 45 schools in the Kutupalong area have been handed over to UNICEF, and we have constructed 75 Learning Centres in the camps. We will also be maintaining the 28 classrooms we operate in host and enclave migrant communities. The Centres are semi-permanent structures, to enable durability against the rains (deep concrete floors), whilst maintaining flexibility on location, should the refugee population move on elsewhere. The programme employs and trains both Bangladeshi and Rohingya teachers. Learning Centres offer basic education, healthcare, nutritional support, and creative opportunities to 7,500 vulnerable Rohingya refugee children who otherwise will have no access to those services. Children benefit from the daily opportunity to play, express themselves and simply enjoy being children. The Centres are unique environments in the camp, with each classroom developed as a bright, colourful haven, with vibrant ‘green spaces’ growing outside each one. Based on our prior experience and lessons learned, we are confident that we are uniquely positioned and qualified to deliver an effective programme to meet the needs of thousands of children. ​“We do everything at the Learning Centre! Dances, games, lessons, but I like the songs best. My teacher says I have a beautiful singing voice. She is very kind and I call her ‘auntie’”. Our work was selected for The Times Christmas Appeal 2017. Visit our 'Times Appeal' page to read their collection of articles.